int…@gmail.com Nice~ I like the color of this. 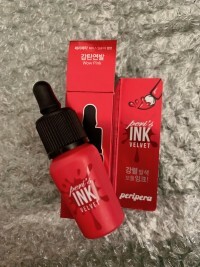 che…@yahoo.com I really love this line of Peripera Peri's Ink The Velvet. I've tried their Elf Rose one before and I wanted a different color and I'm surprised that this color fits me too. It's not too pink and not too red. Very natural color. I would gladly recommend this to friends and I want to try the other colors as well.